You can manage SQL plan baselines using the DBMS_SPM package. 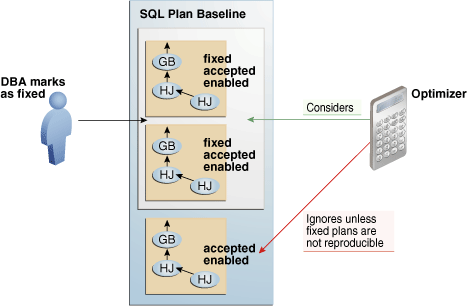 SQL plan management uses a mechanism called a SQL plan baseline. A plan baseline is a set of accepted plans that the optimizer is allowed to use for a SQL statement. In the typical use case, the database accepts a plan into the plan baseline only after verifying that the plan performs well. In this context, a plan includes all plan-related information (for example, SQL plan identifier, set of hints, bind values, and optimizer environment) that the optimizer needs to reproduce an execution plan. This component stores relevant information about plans for a set of SQL statements. See "Plan Capture". This component is the detection by the optimizer of plan changes based on stored plan history, and the use of SQL plan baselines to select appropriate plans to avoid potential performance regressions. See "Plan Selection". This component is the process of adding new plans to existing SQL plan baselines, either manually or automatically. See "Plan Evolution". The primary goal of SQL plan management is to prevent performance regressions caused by plan changes. A secondary goal is to gracefully adapt to changes such as new optimizer statistics or indexes by verifying and accepting only plan changes that improve performance. Description of "Figure 23-1 SQL Plan Baselines and SQL Profiles"
SQL plan capture refers to techniques for capturing and storing relevant information about plans in the SQL Management Base for a set of SQL statements. Capturing a plan means making SQL plan management aware of this plan. You can configure initial plan capture to occur automatically by setting an initialization parameter, or you can capture plans manually by using the DBMS_SPM package. You enable automatic initial plan capture by setting the initialization parameter OPTIMIZER_CAPTURE_SQL_PLAN_BASELINES to true (the default is false). When enabled, the database automatically creates a SQL plan baseline for any repeatable SQL statement executed on the database. The settings of OPTIMIZER_CAPTURE_SQL_PLAN_BASELINES and OPTIMIZER_USE_SQL_PLAN_BASELINES are independent. For example, if OPTIMIZER_CAPTURE_SQL_PLAN_BASELINES is true, then the database creates initial plan baselines regardless of whether OPTIMIZER_USE_SQL_PLAN_BASELINES is true or false. Use Cloud Control or PL/SQL to load the execution plans for SQL statements from a SQL tuning set (STS), the shared SQL area, a staging table, or a stored outline. The following graphic illustrates loading plans into a SQL plan baseline. Description of "Figure 23-2 Loading Plans into a SQL Plan Baseline"
Manually loaded plans are always marked accepted because the optimizer assumes that any plan loaded manually by the administrator has acceptable performance. 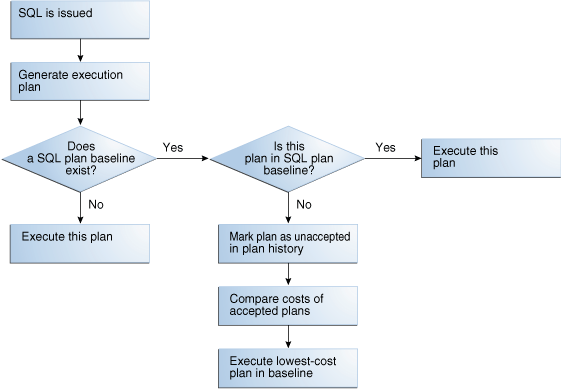 Description of "Figure 23-3 Decision Tree for SQL Plan Selection"
Description of "Figure 23-4 Plan Evolution"
Typically, a SQL plan baseline for a SQL statement starts with a single accepted plan. However, some SQL statements perform well when executed with different plans under different conditions. For example, a SQL statement with bind variables whose values result in different selectivities may have several optimal plans. Creating a materialized view or an index or repartitioning a table may make current plans more expensive than other plans. Description of "Figure 23-5 SMB Architecture"
Description of "Figure 23-6 Fixed Plans"
Access the DBMS_SPM package through Cloud Control or through the command line. Click Files to view the SQL Plan Baseline subpage, shown in Figure 23-7. Description of "Figure 23-7 SQL Plan Baseline Subpage"
This function displays one or more execution plans for the SQL statement identified by SQL handle. This section explains the basic tasks in using SQL plan management to prevent plan regressions and permit the optimizer to consider new plans. 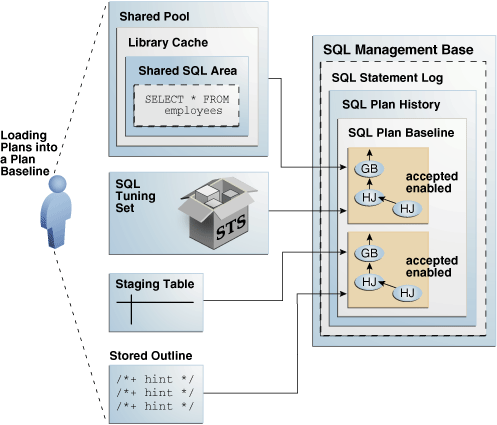 Load plans from SQL tuning sets, the shared SQL area, a staging table, or stored outlines. You control SQL plan management with initialization parameters. For any SQL statement that has an existing SQL plan baseline, the database automatically adds new plans to the SQL plan baseline as nonaccepted plans. The following sections explain how to change the default parameter settings from the command line. If you use Cloud Control, then set these parameters in the SQL Plan Baseline subpage. Setting the OPTIMIZER_CAPTURE_SQL_PLAN_BASELINES initialization parameter to true is all that is necessary for the database to automatically create an initial SQL plan baseline for any SQL statement not already in the plan history. This parameter does not control the automatic addition of newly discovered plans to a previously created SQL plan baseline. When automatic baseline capture is enabled, the database creates a SQL plan baseline for every repeatable statement, including all recursive SQL and monitoring SQL. Thus, automatic capture may result in the creation of an extremely large number of plan baselines. Start SQL*Plus, and log in to the database with the necessary privileges. 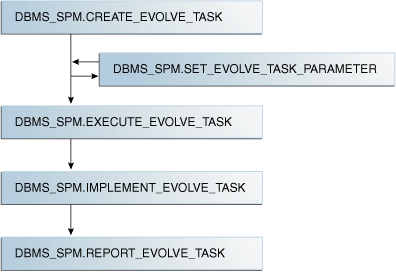 The DBMS_SPM package enables you to configure automatic plan evolution by specifying the task parameters using the SET_EVOLVE_TASK_PARAMETER procedure. Because the task is owned by SYS, only SYS can set task parameters. The ACCEPT_PLANS tuning task parameter specifies whether to accept recommended plans automatically. When ACCEPT_PLANS is true (default), SQL plan management automatically accepts all plans recommended by the task. When set to false, the task verifies the plans and generates a report if its findings, but does not evolve the plans. You do not want the database to evolve plans automatically. This section explains how to show plans in a baseline from the command line. If you use Cloud Control, then display plan baselines from the SQL Plan Baseline subpage shown in Figure 23-7. A SQL tuning set is a database object that includes one or more SQL statements, execution statistics, and execution context. This topic explains how to load plans from an STS. Load plans with the DBMS_SPM.LOAD_PLANS_FROM_SQLSET function or using Cloud Control. The following table describes some function parameters. This section explains how to load plans from the command line. In Cloud Control, go to the SQL Plan Baseline subpage (shown in Figure 23-7) and click Load to load plan baselines from SQL tuning sets. The output shows that the plan is accepted, which means that it is in the plan baseline. Also, the origin is MANUAL-LOAD, which means that the plan was loaded by an end user rather than automatically captured. Default NO means the loaded plans are used as nonfixed plans. YES means the loaded plans are fixed plans (see "Fixed Plans"). "Plan Selection" explains that the optimizer chooses a fixed plan in the plan baseline over a nonfixed plan. This section explains how to load plans using the command line. In Cloud Control, go to the SQL Plan Baseline subpage (shown in Figure 23-7) and click Load to load plan baselines from the shared SQL area. In the preceding example, the variable cnt contains the number of plans that were loaded. The output shows that the plan is accepted, which means that it is in the plan baseline for the statement. Also, the origin is MANUAL-LOAD, which means that the statement was loaded manually rather than automatically captured. For example, you may have investigated a set of plans on a test database and confirmed that they have performed well. You decide to load these plans into a production database. A staging table is a table that, for the duration of its existence, stores plans so that the plans do not disappear from the table while you are unpacking them. Use the DBMS.CREATE_STGTAB_BASELINE procedure to create a staging table. To pack (insert row into) and unpack (extract rows from) the staging table, use the PACK_STGTAB_BASELINE and UNPACK_STGTAB_BASELINE functions of the DBMS_SPM package. 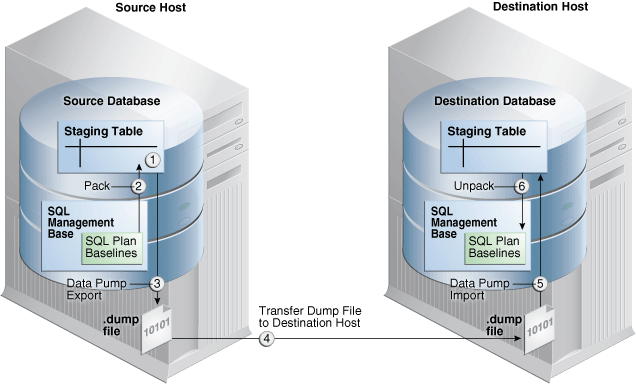 Oracle Data Pump Import and Export enable you to copy the staging table to a different database. The following graphic depicts the basic steps. Description of "Figure 23-8 Loading Plans from a Staging Table"
Using SQL*Plus, log in to the source database with the appropriate privileges, and then create a staging table using the CREATE_STGTAB_BASELINE procedure. Oracle recommends that you configure the SQL Plan Management Evolve task to run automatically. You can also use PL/SQL or Cloud Control to manually evolve an unaccepted plan to determine whether it performs better than any plan currently in the plan baseline. Description of "Figure 23-9 Evolving SQL Plan Baselines"
You do not have the automatic evolve task enabled (see "Managing the SPM Evolve Advisor Task"). Explain the plan for the statement and verify that the optimizer is using the original nonindexed plan. 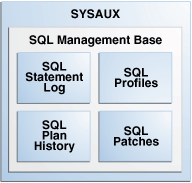 The SQL management base (SMB) is a part of the data dictionary that resides in the SYSAUX tablespace. The SMB stores statement logs, plan histories, SQL plan baselines, and SQL profiles. This section explains how to change the disk space usage parameters for the SMB, and change the retention time for plans in the SMB. The DBA_SQL_MANAGEMENT_CONFIG view shows the current configuration settings for the SMB. Table 23-8 describes the parameters in the PARAMETER_NAME column. A weekly background process measures the total space occupied by the SMB. When the defined limit is exceeded, the process writes a warning to the alert log. The database generates alerts weekly until either the SMB space limit is increased, the size of the SYSAUX tablespace is increased, or the disk space used by the SMB is decreased by purging SQL management objects (SQL plan baselines or SQL profiles). This task explains how to change the limit with the DBMS_SPM.CONFIGURE procedure. A weekly scheduled purging task manages disk space used by SQL plan management. The task runs as an automated task in the maintenance window. The database purges plans that have not been used for longer than the plan retention period, as identified by the LAST_EXECUTED timestamp stored in the SMB for that plan. The default retention period is 53 weeks. The period can range between 5 and 523 weeks. This task explains how to change the plan retention period with the DBMS_SPM.CONFIGURE procedure. In Cloud Control, set the plan retention policy in the SQL Plan Baseline subpage (shown in Figure 23-7).